This important painting by renown Munich artist Eugen Adam (1817 - 1880) was executed 1848 on the base of his jorney to Adriatic coast (Croatia, Bosnia, Walachia and to Turkish board area) in 1845-1846. Our work was situated in the famous collection of Dr.Georg Schaeffer , Schweinfurt/Germany and after his death was purchased on the sale "Collection of Dr.Schaeffer" by Neumeister Munich, 2005. 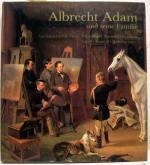 The painting was described and illustrated in the important exhibition cataloque "Albrecht Adam and his family. 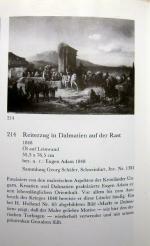 To the history of Munich artist's dynasty" by U.von Hase-Schmundt, page 246, Munich,1981 (see additional photo). Here is the quote from the artist's memories about the place, time and circumstances by creation of this painting: " .. 1845..... In August - Croatia... I saw turks and drawed them as horsemen. I remain 8 days on the Turk board in the house of Sluiner National Border Regiment in the middle of Greek village , where women in the same costumes as perhaps in Athens walking around and here call Walachian woman and the men dressed in red mantle and called Serechasser . I bring all of these types in my sketches..."
Eugen Adam (1817-Munich - 1880 ) was famous German battle, horse, genre and historical painter , the third son of painter Albrecht Adam, he became popularity at first as battle painter with military episods and scenes, which he collected by Italian campaign 1848-1849 . He specialised on animal, genre, landscape and battle paintings. He had his atelier in Munich, and lived in Milan during the years 1849-1858. In 1859 he became war reporter for the journal "Über Land und Meer". In 1861 he participated in Swiss campaigns, in 1870 and 1871 in the war between France and Germany. Provenience : Collection Georg Schäfer ,Schweifurt ,Germany, purchased on the sale of Neumeister, Munich, 2005. Technique: oil on canvas. Luxuriousy original period frames.